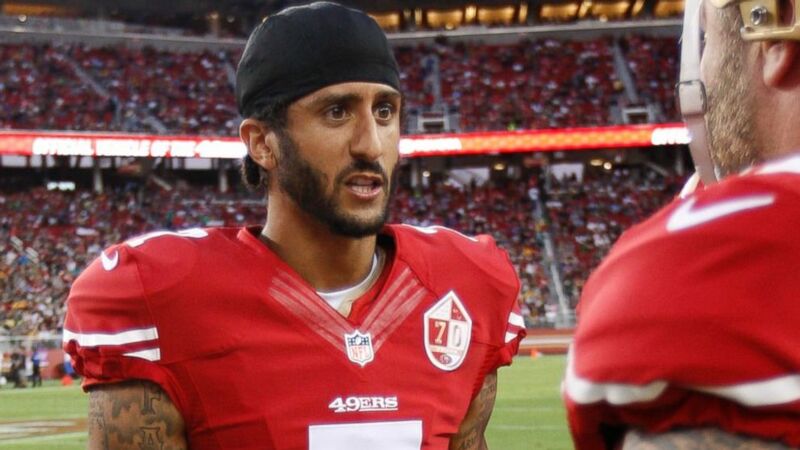 The 49ers quarterback said he wore the socks to speak out against "rogue cops." San Francisco 49ers quarterback Colin Kaepernick has responded to critics who slammed him for wearing socks during practice with imagery deemed offensive and disrespectful to police officers. Photos emerged this week of Kaepernick at an Aug. 10 practice at San Francisco's Kezar Stadium wearing black athletic socks covered in illustrated pigs wearing a police hats. The term "pig" is a derogatory term for police officers. Bill Johnson, executive director of the National Association of Police Organizations, told USA TODAY Sports the socks are "disrespectful," adding, “It’s just ridiculous that the same league that prohibits the Dallas (Cowboys) football club from honoring the slain officers in their community with their uniforms stands silent when Kaepernick is dishonoring police officers with what he’s wearing on the field." The Burlington Police Department in Vermont tweeted, "Wearing 'pig socks' cannot be compared to protesting oppression in broad, powerful messages like Ali, Smith & Carlos. Inspiring vs. crass." Another tweet read, "Wealthy, privileged person's free speech dehumanizes entire group of human beings. Sound familiar, #Kaepernick?" Kaepernick, 28, posted a statement to Instagram, writing that he wore the socks in the past because of the "rogue cops that are allowed to hold positions in police departments." Not only do the "rouge cops" put the community in danger, but they also put cops with the "right intentions in danger by creating an environment of tension and mistrust," he wrote. After stating that he has two uncles and friends who are police officers, Kaepernick wrote that he wore the socks in the past to take a "public stance." Kaepernick, who faced criticism since last weekend for not standing during the playing of the national anthem during preseason NFL games, has said he plans to sit out when the "Star Spangled Banner" is played tonight in San Diego against the Chargers. His protest will continue indefinitely, he has said. “When there’s significant change and I feel like that flag represents what it’s supposed to represent in this country, I’ll stand,” Kaepernick told reporters Sunday. (Michael Zagaris/San Francisco 49ers via Getty Images) Colin Kaepernick of the San Francisco 49ers stands on the sideline prior to the game against the Green Bay Packers at Levi Stadium on Aug. 26, 2016 in Santa Clara, California. Tonight's game is noteworthy because it is Military Night, billed as a tribute to "hundreds of thousands of current and retired military personnel who live and work in San Diego," according to the Chargers website. “I am not going to stand up to show pride in a flag for a country that oppresses black people and people of color,” Kaepernick told NFL Media. “To me, this is bigger than football, and it would be selfish on my part to look the other way," he said. "There are bodies in the street and people getting paid leave and getting away with murder." ABC News' Michael Edison Hayden contributed to this report.